Eton 3.5 seater sofa with pillow backs. Size: 230cm/91″ long x 100cm/39″ deep. Frame and seats Cristina Marrone Avanti AVA1290 willow. 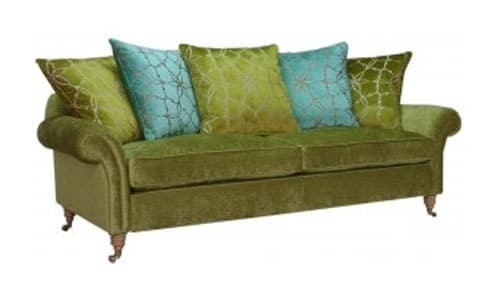 Pillow backs 3 x Harlequin Pasha pistachio, 2 x Pasha ocean. Natural legs with brass castor. Feather seat and back fillings. Matching chair and stool in Avanti AVA1290 willow.